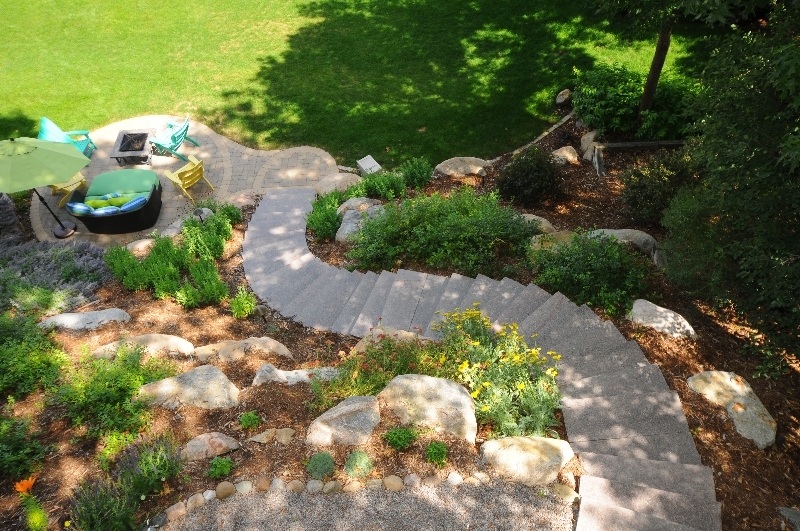 Here we have a hillside landscape project on Lake Minnetonka that posed many challenges to the homeowner. First and foremost, the hill is quite steep so stability and erosion control had to be taken into consideration. At the bottom of the hill is a beautiful level lawn area that runs into the shoreline of the lake, so the entire hillside is in view from the lake, with a stunning home resting on top. Because of this lay of the land, the client really wanted to replace the current overgrown mass of sumac, brush and weeds with something more suitable for the property. Aside from the visual change needed, there was also the question of how to comfortably traverse the hill from the home to the lake. As you can see, we designed two separate staircases to acheive an overall balanced look, as well as taking advantage of the various entry and exit points that dictate the natural flow of the home and decks. For the staircases, we used four foot wide Carnelian Granite steps. Granite steps are very level along the top and the surface is slightly textured offering safe footing, and since these steps are cut, the riser heights are extremely similar from one step to the next making for a comfortable walking experience. The lower level entertaining area at the bottom of the hill is a patio built with Anchor Charleston tumbled pavers. We combined the colors Walnut and Fieldstone for the body of the patio and laid it with a four piece random pattern. To highlight the separate areas of the patio, a border and inlay of Anchor Charleston in Cambray Tan was used. The patio is now home to some no maintenance furniture made of recycled materials and bring fun, whimsical color to the project. The hillside itself was cleared of all debris and we used fieldstone boulders in a variety of sizes, some very large, in order to properly maintain areas of the slope. While the boulders were used to retain certain areas, we also attempted to make the whole installation feel very natural and somewhat random. To contrast the boulder outcropping look, the design used plant material in a very organized way to compliment the architecture of the home. Rather than tons of different plants, a rather small roster of varieties were chosen, but were massed in drifts for the highest impact when viewing the landscape from Lake Minnetonka or from within the home. With the existing large Oak trees and the various vantage points of the new landscape, we installed a complete low voltgae lighting system utilizing Kitchler light fixtures for everything from up-lighting the silhouette of the Quacking Aspen to down-lighting from high within the Oak trees. We feel it’s the little things such as lighting, annual flower containers, and creative furnishings that really help tie a total renovation such as this together.